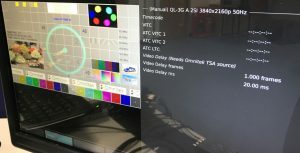 xG Technology announced that IMT Vislink will be demonstrating an enhancement to its HCAM and UltraReceiver wireless camera solution to provide single-frame end-to-end latency for 4K UHD transmissions at IBC 2018 (Stand 1.A69). HCAM is the most widely deployed HEVC 4K UHD wireless transmitter on the market. It supports applications such as ENG (Electronic News Gathering) and premium live sports broadcasts. It features user-interchangeable RF modules and a range of software options — including the capability to be HDR Ready. With highly flexible and configurable mounting options and intuitive video interfaces, the unit can be mounted to broadcast cameras, ENG cameras, and prosumer cameras. HCAM features dual SFP modules supporting quad 3/6/12G SDI/HDMI/Fiber Optic/SMPTE 2022-6 HD-SDI over IP interfaces. It’s also designed with Wi-fi and Bluetooth control via a dedicated Android and iOS app. In addition, the unit features integrated camera control with Vislink FocalPoint compatibility and direct-docking V-Lock and Anton/Bauer battery plates with integral power feed through. It is also compatible with Vislink’s L1750 range of transmitter modules via RTB modification.